Her husband had died the month before, and I had conducted his funeral. Hence, I got the call from her daughter, who now wanted “a miracle” for her mom. She bonded with this bedridden woman! This picture was taken by the woman’s daughter, as the rest of us watched in stunned silence and prayed, channeling all kinds of positive healing into her dying mother, through Candy in her new-found role as therapy dog. Once at her bedside, Candy instinctively rose up on her hind legs, then slowly slid forward to nuzzle with her snout probing this woman. Candy then leaned forward onto the hospital bed, fully extending her torso to cuddle, while maintaining two feet on the floor at all times, as good dogs (and people) do. 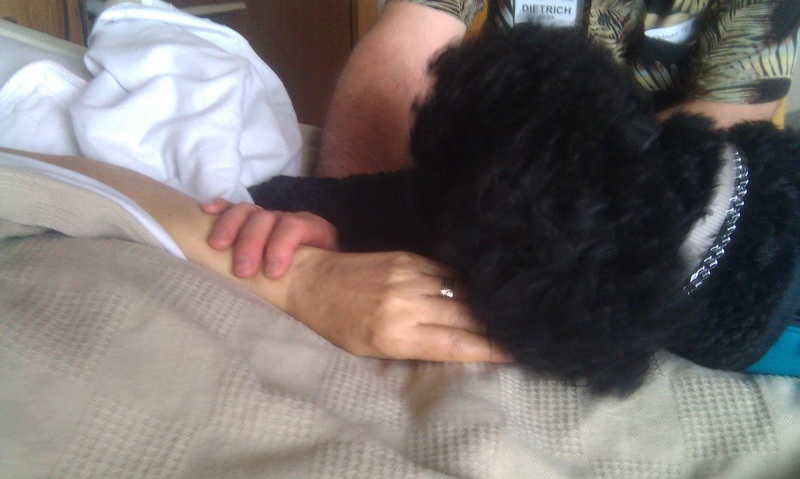 Our beloved black poodle maneuvered to grab the woman’s hand, with her paws, as in prayer. That was truly a “wow” experience, even a bow-wow one. We later learned that our elderly friend is a dog-lover herself, with two standard black poodles in her background. Did Candy somehow know? What stirs you up likewise, to more love and good works? 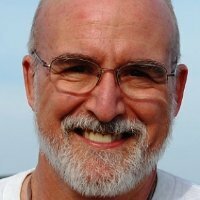 Have any of you witnessed similar acts of kindness with a dog reaching out and touching someone who is ill or grieving loss? Fast forward four years and two poodles later. Candy has since been placed with a blind little boy, fulfilling her life’s calling as a guide dog. My wife Sue and I have also moved on—from being foster parents of a very trainable poodle, to becoming forever parents to two hurting rescue dogs, Cherie & Chloe, also the same breed as Candy. The tables have turned in our caring relationship, too. 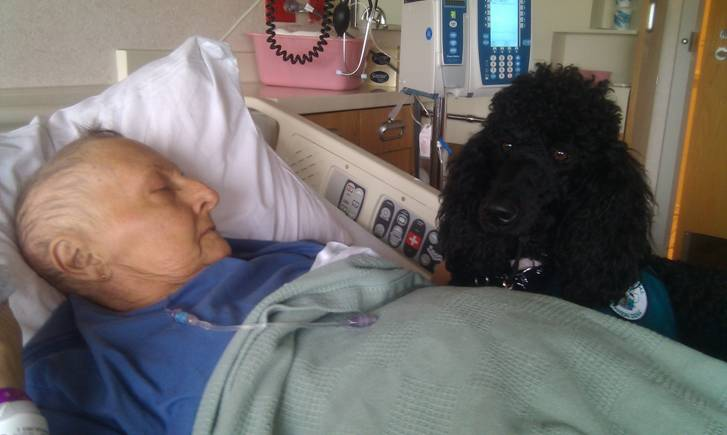 Our poodles do not just care for those who need licks and lots of love; they receive cares. Last week we learned that our beloved Cherie is stricken with lymphoma, a cancer that is already spreading to her lungs. She is now the patient, with another dog attending to her. In the weeks to come, Cherie and the humans on the other end of her leash will accompany each other on the last earthly leg of her journey from this life into the next. This will be sad for us, especially for Chloe, the womb mate left behind. After years of bouncing around from shelter to shelter, abused in one setting or another, they were abandoned altogether by the time we found them 3 ½ years ago. Just as that elderly cancer patient we visited and followed with Candy from place to place—from home to hospital to hospice to funeral home—so also we are prepared to take a similar journey with our current canine companion. This time our dog is on the receiving end of another’s kindness. Such are the twists and turns of a caring canine friendship. We give and they give back even more. They receive what love we give and we are more blessed for having loved and lost. If any one know his /her one God. He/her know which one of the world thinking uses hes/her life? Beautiful!!!! Thank you so much for sharing this story. Loved your blog. Thanks for sharing the story. Wonderful story. 2 of our cats also exhibit this kind of physical affection when one of us is ill or sad. They are very sensitive creatures.